Firearm-related homicides in Canada have been steadily increasing, reaching a total of 223 in 2016, 44 more than the previous year. Shootings have now become the most common method of homicide, surpassing homicide by stabbing and beating. Gang-related homicides involving guns are no exception. In 2016 alone, police reported 141 gang-related homicides, 45 more than in 2015. Since 2013, gang-related homicides in Canada's largest cities have almost doubled. In November 2017, the federal government announced approximately $327.6 million over five years, starting in 2018–19, and $100 million annually thereafter, in new federal funding to tackle the increase in gun related violence and gang activity in Canada. This initiative will bring together federal, provincial and territorial efforts to support community-level prevention and enforcement efforts, build and leverage unique federal expertise and resources to advance intelligence related to the illegal trafficking of firearms, and invest in border security to interdict illicit goods including guns and drugs. Funding would also be provided to Indigenous communities and organizations to help build capacity through education, outreach and research, addressing the unique needs of Indigenous communities and urban populations. The initiative will help reduce criminal gun and gang violence so that Canadians can feel safe in their communities. As part of this overall initiative, the Minister of Public Safety and Emergency Preparedness convened a Summit on Gun and Gang Violence on March 7, 2018, in Ottawa to engage stakeholders and address the challenges, opportunities and best practices for reducing gun crime and gang violence in Canada. More than 180 individuals participated in the Summit and provided their perspectives and input on these important issues, including representatives of community, youth and Indigenous organizations, law enforcement, criminal justice, all levels of government, former gang members, academics, gun-owner groups and victims of violence. Determine how to advance efforts in prevention, intervention and suppression. As mentioned, the over 180 participants included representatives of community, youth and Indigenous organizations, law enforcement, criminal justice, all levels of government, former gang members, academics, gun-owner groups and victims of violence. In addition to a rich variety of presentations (see Appendix A), at the end of the day participants engaged in table discussions to consider the way forward and offer advice to the Minister. The proceedings were also available via webcast, livestreamed on the Public Safety Canada website and by the CBC and CPAC. There was active engagement on social media, with #gunsandgangs trending well throughout the day. Individuals who were not able to physically be present were able to provide input through a number of avenues, including the Public Safety Canada website and by e-mail during the live webcast. The proceedings are available for viewing on line (recorded webcast). In addition, the last session of the afternoon allowed for facilitated discussion on a variety of topics: prevention, intervention, and rehabilitation initiatives; legislative and regulatory initiatives; investigation and enforcement activities; knowledge, data and information sharing; partnerships and collaboration; and, funding. Brief summaries of the presentations included in each of these themes appear in Appendix A. The presenters reminded the audience that there is considerable regional variability in the characteristics of gangs – as well as in the responses found to be most successful in addressing them. The nature of gangs has been evolving, and the new forms and ways of operating pose an increasing challenge for law enforcement. There has also been an emergence of “new age gangs” – a term used by Dr. Catherine Prowse to describe the loose-knit and fluid groups of “players” who are part of a leader's social network, without necessarily having a gang name and group identity, and are not tied to a geographic turf. While gang members are primarily male, and new Canadians and Indigenous people are over-represented in gangs, in her studies of Manitoba gangs, Dr. Kathleen Buddle found a significant degree of cross-cultural integration, as individuals tend to face similar struggles that cut across ethnic, racial and cultural lines. Gangs are increasingly innovative in their approaches. For example, the trade in illegal firearms is aided by the “darknet” on the worldwide web, which allows anonymity and provides a borderless, international on-line trade in illicit materials including illegal drugs and stolen firearms. Tracking is extremely difficult and policing the darknet requires highly skilled investigators. In responding both to this phenomenon and gang activity more generally, the Royal Canadian Mounted Police (RCMP), the Canada Border Services Agency (CBSA) and other law enforcement entities work collaboratively, domestically and internationally, to curb the illicit movement of firearms, and to trace seized firearms and identify the sources. Complementarily, across the country, the training of prosecutors, law enforcement and others in the criminal justice system is ongoing in an effort to curb organized crime and firearms-related offences. At the level of prevention and intervention, collaborative community programs are working to support young people and others in terms of helping them decide against pursuing gang life or to exit from a gang. Support is also necessary, and provided in innovative fashions, for family and friends of gang members and former gang members, as well as for individuals and communities who have been impacted or victimized by gang activities and crime. Many such interventions focus on the individual and work to develop holistic approaches to intervention. A small number of extracted comments from presenters serve to illustrate the complexity of gun and gang violence. 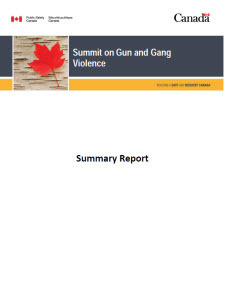 In the final session of the Summit, participants were asked to discuss and present their views regarding the way forward in addressing gun and gang violence and how to improve and strengthen strategies and initiatives. A number of key themes arose during these discussions and were paralleled both via the other means participants had to provide feedback and in the presentations. Participant feedback is summarized thematically below, and is presented in greater detail in Appendix B. Initiatives need to address the most vulnerable people, be culturally sensitive, relevant to community needs and involve the people that they serve. As well, initiatives should look beyond the immediate problem of guns and gangs to holistic, “healthy communities” approaches and those that address the roots of violence. Moreover, it is important that a richness of different interventions exist in order to target different needs and reach different clienteles, such as youth, women, and Indigenous Peoples. Legislative and regulatory initiatives' effectiveness can be strengthened when these are aligned at federal, provincial/territorial, and municipal levels, and when such initiatives are introduced in a timely manner. New initiatives should be nimble and responsive to changing realities. For example, these could include restricting bulk firearm purchasers, requiring sellers of non-restricted firearms to keep sales records to enable tracking of gun ownership, adopting measures to address the use of rental vehicles for criminal activity, and updating privacy and related legislation to ensure appropriate access to information in a gang activity context. Effective investigation and enforcement around gangs and gang activity requires specific training for police working in this area, including training and technology resources around investigating illegal gun and gang activity on the internet. More detailed suggestions were also made, such as expanding the ability of enforcement agencies to use canine units to establish probable cause. There is a need for enhancements both in data collection/reporting and information sharing. Participants identified the need for research that is informed by law enforcement and community groups working in the areas of guns and gangs, such as predictive analysis of emerging “hot spots” of gang activity, as well as sources and movement of firearms and gang members. Finally, there is a need for increased information-sharing, both of research and best practices, as well as opportunities like the Summit where those working in the field can share experiences. There is a need to improve collaboration within sectors and across sectors at the community, regional and national levels. Initiatives to explore include formalizing partnerships through Memoranda of Understanding and promoting the need for organizations to have a defined strategy for collaboration, perhaps as a requirement for program funding. Addressing the challenge of gangs and their underlying issues is a long-term endeavour that requires long-term, stable funding to be successfully addressed. Funding should not only target supporting proven, evidence-based programs but should also be flexible enough to support innovative, new approaches that may not yet be proven. “We cannot arrest, charge and imprison our way out of this problem.” Better prevention strategies and a collaborative, multi-sectoral approach to gun and gang violence are needed, to improve the safety and security of communities. A coherent national approach is necessary because gun violence and criminal gang activity cross borders and change shape quickly. Minister Goodale reminded participants of the government's November 2017 commitment of $327.6 million in new federal funding over five years, and $100 million every year thereafter, to combat gun and gang violence. The work of addressing gang violence needs to be anchored in the Canadian reality and begins with an understanding of young people's lives, taking particular note of racialized minorities and those born outside of Canada. We need to see youth not only as gang-involved but as whole human beings, and consider their cultures, their roles and interactions in their families and communities, and their identity formation. We need to look both at the choices they have made and the ways that our societal systems may have failed them. STR8UP is one of the only organizations that works strictly with ex-gang members in Saskatchewan, helping people remove themselves from gangs and recover from the effects of gang life. Since its founding in the 1990s, STR8UP has served more than 400 people and presented over 2000 times to organizations across Saskatchewan, Alberta and Manitoba on the realities of gang-life. Holding true to its grassroots beginnings, STR8 UP former gang members represent one-third of its Board of Directors and one-half of its staff. As individuals struggle with the effects of trauma, the child welfare system, colonization and more, STR8UP supports them to “determine their own destiny” in numerous ways, including peer mentoring and job placement. STR8UP works both inside and outside the correctional institutions to make individuals and communities safer and healthier. It is currently, both “underfunded and understaffed”. The only information Statistics Canada has, related to gang criminal activity, is on gang-related homicides. The statistics, with the exception of homicide, do not include data from Quebec. While there is a downward trend in the overall rate of violent crime, there has been an increase in gun-related crime since 2013. About half of gun-related homicides are gang-related. There are still significant gaps in the data. For example, we do not know if firearm-related violent crimes are linked to organized crime. Social networks are an essential feature of gangs. Networks provide information on their relationships both inside and outside of the gang, as well as gang members' decision-making around collaboration for specific crimes. Social network analysis can help predict who will become a gang member, who is likely to be a current member, and who may become a victim of gang-related violence. Some gangs have a "core," some don't; in approaching the issue of gang boundaries, we need to assume little, and follow the social ties. Mapping gang networks can help shape proactive action in prevention, intervention and enforcement approaches. Most of the internet (about 95%) is accessible only with special software and tools and is known as the Deep Web. A smaller component of this Deep Web is the Darknet, where certain tools can allow anonymous interaction and content, setting the stage for an international on-line market in illicit goods, including illegal firearms. Cryptocurrencies and “stealth shipping” methods help sellers and buyers evade detection, and their methods evolve rapidly. Thus, conducting on-line investigations requires highly skilled personnel. Canadian cities are generally safe by world standards, but we cannot be satisfied with current trend lines. In Toronto, at least 65% of gun homicides have some connection to gangs. Toronto has developed a number of successful approaches, including a Gun and Gang Task Force; integrating different levels of policing; and Focus Toronto, addressing issues like housing and mental health. There are numerous gaps and shortcomings in terms of legislation, collaboration and availability of federal resources for effective community action. The issue of gangs and organized crime is one of the top policing priorities across the country. British Columbia is a major trans-shipment point for illegal goods, including drugs and firearms. B.C. uses an integrated enforcement model, bringing together local, provincial and federal forces, and police forces to collaborate with community partners. Initiatives include Surrey Wraparound, the End Gang Life Program, the Gang Intervention and Community Engagement Officer Program, and the Prolific Violent Gang Offender Management Program. The issue of gun violence and gangs extends from our largest cities to our most remote communities. We must all work together, with collaboration among policing agencies and among the various levels of government for funding. We need to look at the social dimensions, the trans-border and international dimensions, and remove impediments that prevent law enforcement agencies from obtaining the evidence they need. Regarding privacy and security issues, “privacy should not mean anonymity”. British Columbia has a multi-pronged anti-gang strategy to address gangs and alleviate their effects. There are numerous initiatives in prevention, intervention and enforcement. The BC Illegal Firearms Task Force made 37 recommendations in the Fall of 2017, issuing a call for the federal government to enhance certain federal laws and programs, including changes to the Criminal Code and the Firearms Act. It is important to address the links between organized crime, guns and drugs, particularly opioids, and to make sure these initiatives are adequately resourced. The CBSA provides integrated border services, processing over 90 million travelers arriving in Canada annually. Approximately 96% of 2017 firearm seizures arrived by highway. CBSA uses technology and dog teams to detect concealed firearms and other prohibited goods. CBSA collaborates with other domestic and international law enforcement agencies, working to curb the illegal smuggling of firearms and to trace seized firearms in order to identify trafficking networks. They also collaborate to identify persons who are part of organized crime groups. Focusing in on at what happens after a firearm seizure, there are two specialized units which offer support to all law enforcement agencies. These are NWEST and the Canadian National Firearms Tracing Centre (CNFTC). NWEST offers expertise in areas such as classifying firearms, providing expert testimony, firearms testing, support in writing search warrants, etc. CNFTC works to identify the source of illegal and illicit firearms, providing additional investigative elements in criminal cases. The Ministry works to educate criminal prosecutors, enforcement personnel and others across the country in the extremely complex process of prosecuting organized crime offences, beginning with education on the application of the Criminal Code. The second area of education and training is in prosecuting firearms offences. They provide timely updates and education on legislative challenges and support collaboration and integration among agencies, including Corrections, Probation and Parole, CBSA, and others. WrapED focuses on 12-17-year-old Indigenous, immigrant and refugee youth, at risk of, or engaged in gang activity. They include some of Edmonton's most vulnerable youth. WrapED uses a High Fidelity WrapAround Process. It relies upon collaboration among youth facilitators from four front-line agencies and the local police service. The emphasis is on developing meaningful relationships with the youth, helping them access resources, encouraging cultural connections, and supporting “client voice and choice”. March 7, 2018 | 7:30 a.m. – 4:45 p.m. The rise and challenge of darknet markets and firearms internet trends. Leaders will present on their jurisdictions' challenges, initiatives and best practices. What motivates individuals to join gangs, and to leave them? Feedback was gathered not only from participants at the Summit, but also via email from those who made submissions during the event. Prioritize evidence-based interventions, while still allowing for innovative new approaches. Need a critical assessment of approaches and programs, improved transparency and accountability and programming performance metrics. Develop screening tools and a comprehensive intake system for the most vulnerable people. Undertake a “Healthy Communities” approach based on community identification of needs, encompassing housing, health care, education, clean water, social services and employment, mental health supports, family supports. Adopt or expand Restorative Justice models, which include victims of violence and their families, in the healing and re-integration process. Focus on rehabilitation of those within and exiting the criminal justice system. Incorporate a gender lens in addition to lenses of ethnicity and indigeneity; develop responses that are culturally-sensitive and relevant to community needs. Understand the roots of youth violence, listen to the voices of youth, support youth-to-youth programs and entrepreneurship programs for youth. Support to address the “programming vacuum” for youth age 12-16. Develop responses which are culturally sensitive and relevant to community needs. Align federal, provincial and municipal legislation. Ensure any new legislation is introduced in timely manner. Update privacy and related legislation to ensure appropriate access to information in a gang activity context. Require sellers of non-restricted guns to keep sales records, including private sales, to enable tracking of gun ownership. Restrict multiple purchases of firearms. Adopt measures to crack down on use of rental cars for criminal activity. Make use of peace bonds for high risk individuals. Offer better or more training for law enforcement officers working with gangs. Expand support to enable timely investigation and prosecution. Reduce administrative aspects of enforcement work. Increase resources available to investigate illegal activity on the internet, and for new technological tools. Expand ability of enforcement agencies to use canine units to establish probable cause. Implement more fulsome measures for witness management and protection. Greatly improve data collection, analysis and information-sharing within sectors (particularly law enforcement) and across sectors (community agencies, academics, law enforcement, government, etc.) at the community, regional and national levels. Utilize consistent definitions of terms. Ensure academic research addresses questions and issues that are posed by community groups and law enforcement and is applicable to their work. Develop methods to identify and share best practices, to identify and communicate innovative approaches and to tailor responses to regional realities. Create national clearinghouse/centre of excellence to gather and disseminate information and research results in a timely manner. Take steps to address systemic bias and ensure adequate consultation with particular communities most affected by these public safety concerns. Provide federal funding for local organizations to come together in various ways and share information and experiences (e.g., a similar Summit which is youth-focused, to hear the youth voice). Use data to support better identification of vulnerable communities, the factors leading to gang involvement and a reliable risk/needs assessment process for those under 12, older youth and adults. Need clarity around data/statistics connecting gun violence and gangs. Gather data on gang involvement in more types of criminal activity, on the origin of firearms involved in gun crime, on the identity of both victims and persons accused of firearm-related violent crime and data about marginalization and gun crime. Collect more robust operationally-relevant data (e.g., sources and movement of firearms and gun parts, movement of high level criminals, better data from Uniform Crime Reports). Greatly improve collaboration within sectors and across sectors (community agencies, academics, law enforcement, government, etc.) at the community, regional and national levels. Expand integrated teams approach (community program staff and policing) and provide training for these teams; include education on gun legislation. Explore formal Memoranda of Understanding, such as that developed between Ottawa Police Service and John Howard Society. Adopt a more collaborative framework within and among levels of government. Require that organizations have a strategy for collaboration, as one of the criteria for program funding. Need means of trust-building; finding a “middle ground” and going beyond stereotypes. Base funding decisions on evidence-based programs. Make funding available for innovative, new approaches that may not yet be proven. Ensure long-term stable funding, particularly for community level prevention and intervention initiatives. Streamline funding (municipal, provincial, federal) and coordinate funding mechanisms. Allow more funding to flow from federal to regional/municipal level.